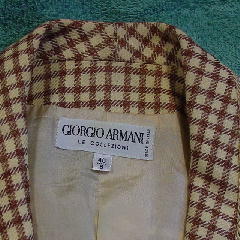 This vintage Giorgio Armani jacket is 45% rayon, 40% flax, 10% nylon, and 5% silk. 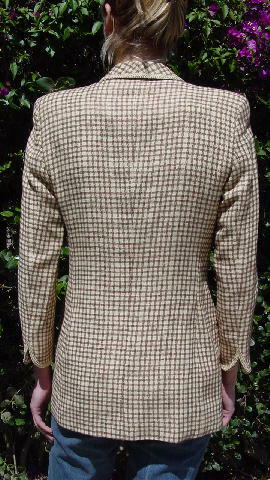 It has a plaid pattern in a vanilla-yellow cream and light chocolate brown. It has long thin lapels and a one button front closure. The long sleeves have a 2" bottom side slit and there are shoulder pads. It has a breast pocket and 2 lower front slash pockets, one of which is still sewn shut. 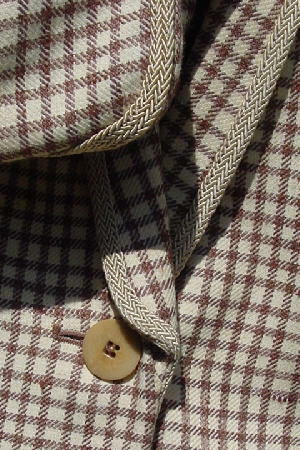 There is piping around the collar, down the lapels, and around the sleeves.